Milk ducts are present in breast tissue at birth, but they remain small and unused until puberty. At puberty, hormonal changes cause milk ducts to grow. During pregnancy, milk ducts are activated and milk production begins. There are between 15 and 20 lobes in each breast and each lobe has one milk duct. Milk production reaches all time high when milk comes in during the first weeks after birth. Eventually, milk production evens out and each breast produces just enough milk to satiate your infant. When too much milk is produced milk ducts can get backed up or clogged causing plugged milk ducts. Symptoms of plugged milk ducts and mastitis are similar, but mastitis is an infection and a plugged milk duct is not. Infection causes fever and requires antibiotics, in some cases, to cure the infection. Plugged milk ducts can cause mastitis if left untreated. You may notice a small lump on your breast. This lump may be red and slightly swollen. You may even feel a bit of heat on or around the plugged milk duct. There is a chance that more than one milk duct becomes plugged at the same time causing a larger knot or swollen area. Leaving too much milk in the breast is the main cause of plugged milk ducts. Generally, infants drain both breasts during regular feedings. If baby is sick or refuses to complete a feeding, milk may collect in the breast. Illness, stress and extreme fatigue can result in lax breastfeeding or pumping, resulting in milk staying in the breast too long. Your breasts may feel engorged or overfull. The best treatment for plugged milk ducts is breastfeeding or pumping. Offer the affected breast to baby first. Draining milk from the breast will relieve pain. Massage the lump, apply heat and cold compresses and pump often. You can also choose to change your breastfeeding position to encourage complete draining of the affected breast. If you choose to nurse on just the affected breast and baby complies, you may need to pump or express breast milk from the unaffected breast to prevent plugged milk ducts on that side. 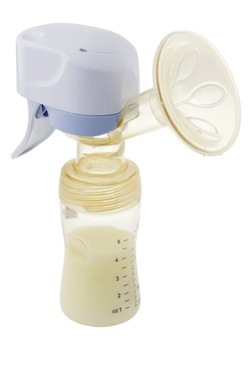 Make sure you are using a strong breast pump that completely drains the breast of milk. Plugged milk ducts are a common condition of breastfeeding. Completely draining the breast of milk reduces the risk of plugged milk ducts dramatically. If your plugged milk ducts become infected mastitis may develop. Mastitis is an infection that may require antibiotics.